If your in need of a full selection of Pantone Colour Charts and Pantone Chips and would like to save some serious bucks, then the Pantone Reference Library could be the set for you! 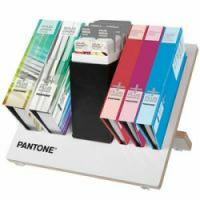 This extensive 14 guide collection gives you all Pantone spot, metallics, pastels, neons and process colours and a professional looking storage stand to keep your guides safe, organised and beautifully displayed. Plus, you'll save over £250 on the purchase price of the guides, if bought separately. See a full list of which Pantone charts are included in the Pantone Reference Library.